While it could be argued that turtles, birds, and horseshoe crabs seem to preoccupy most of the sanctuary’s staff and volunteers, a wild organism doesn’t always have to qualify as fascinating fauna to get some attention around here. Nancy Braun takes copious notes whenever she’s looking at and studying plants. (Photo by Jeannette Bragger). 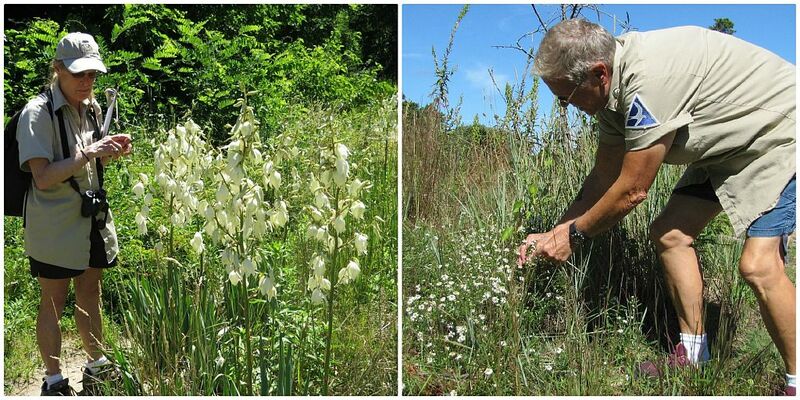 Among the most enthusiastic advocates of the sanctuary’s flora are volunteer naturalists Jeannette Bragger and Nancy Braun, who are often found on the trails together discussing– and sometimes even debating— the identity of the sanctuary’s diverse wildflowers, grasses, trees, and lichens. Nancy (left) photographs yucca flowers. Jeannette (right) examines late summer asters. 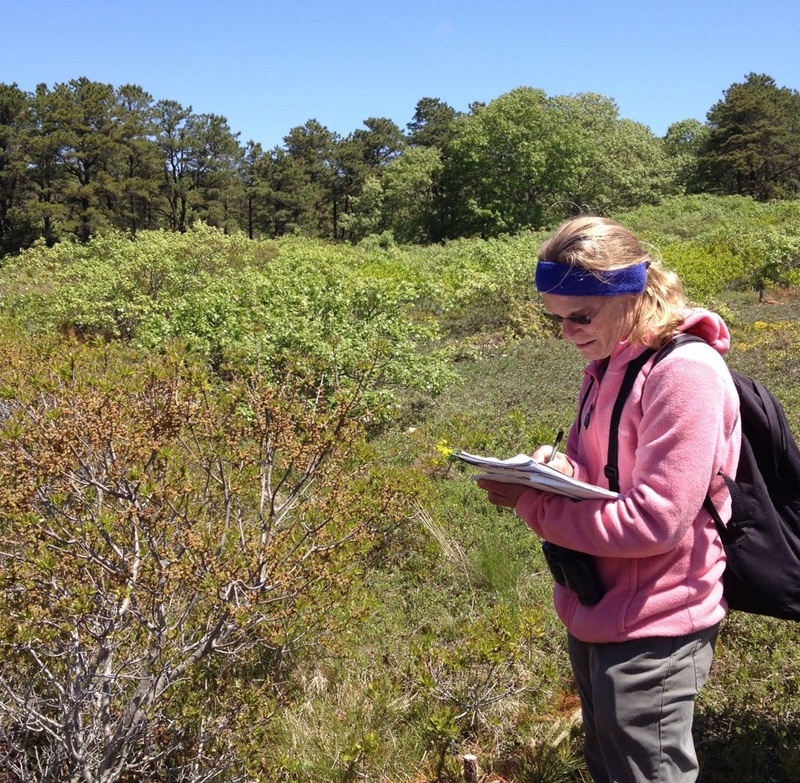 Both women are long-time plant fans and students of local vegetation and both began volunteering at Wellfleet Bay over ten years ago. “I realized that plants were easier to learn than birds because they can’t fly—they stand still!” says Nancy. 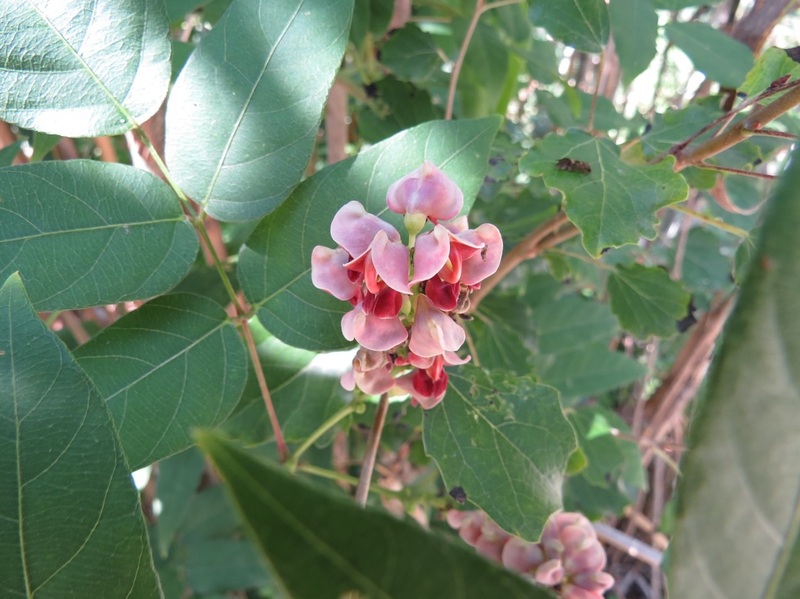 She especially enjoys plants with leaves or flowers with lovely scents, such as sweet everlasting, bayberry leaves, groundnut and sweet pepperbush, all located on the sanctuary if you know where to look—or smell! Growing up in Switzerland in the Alps, Jeannette Bragger says she spent most of her time in trees, even doing homework in an old apple tree next to her house! As trail naturalists, Jeannette and Nancy will occasionally closely scrutinize a plant to provoke a visitor’s curiosity. “That’s when we get a chance to tell them about the plant and the animals associated with it. “We try to give them a “hook”—some interesting story or characteristic—so that they’ll remember the plant after they leave,” Jeannette notes. 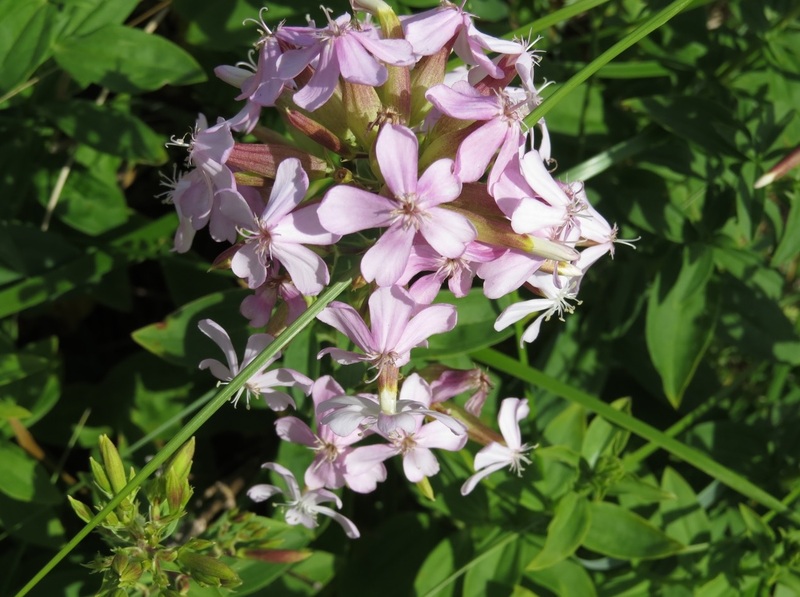 A plant with a story: Bouncing Bet, a European native, is also known as soapwort, part of the carnation family. It’s said that when its roots are dampened with water, they produce a mild soap that reputedly was used to clean the Shroud of Turin. We can’t confirm the full story but it does make the plant more memorable! (Photo by Jeannette Bragger). Jeannette says she and Nancy learned a great deal from botany walks with staff and other volunteers, such as Dennis Murley, Art King, and, more recently, science coordinator Mark Faherty. Trailing arbutus or Mayflower, the official state flower. (Photo by Jeannette Bragger). 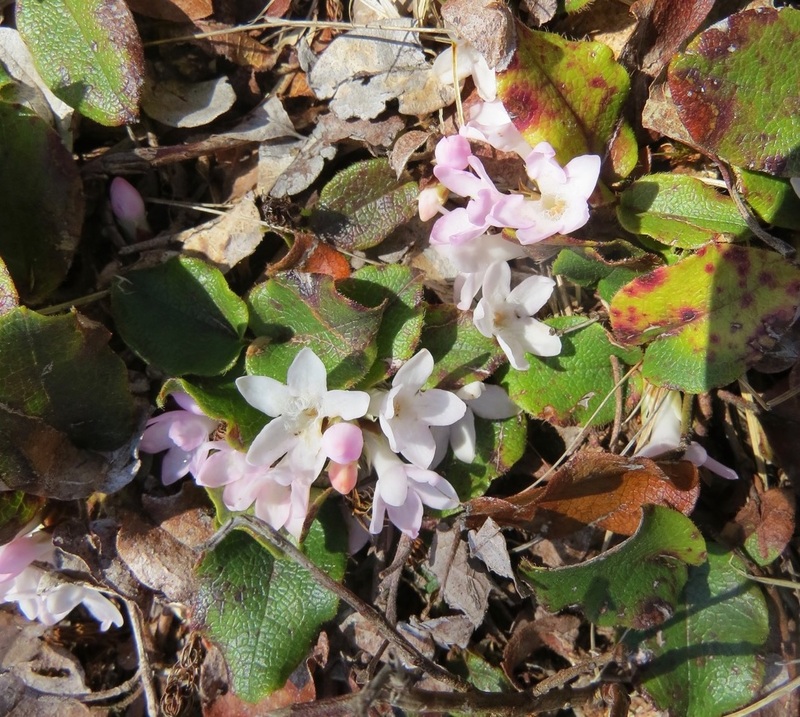 Both women delight in seeing one of spring’s first fragrant white and pink flowers of the trailing arbutus (“Epigaea repens, also commonly called Mayflower—not to be confused with the Canada Mayflower!” Jeannette is careful to note). 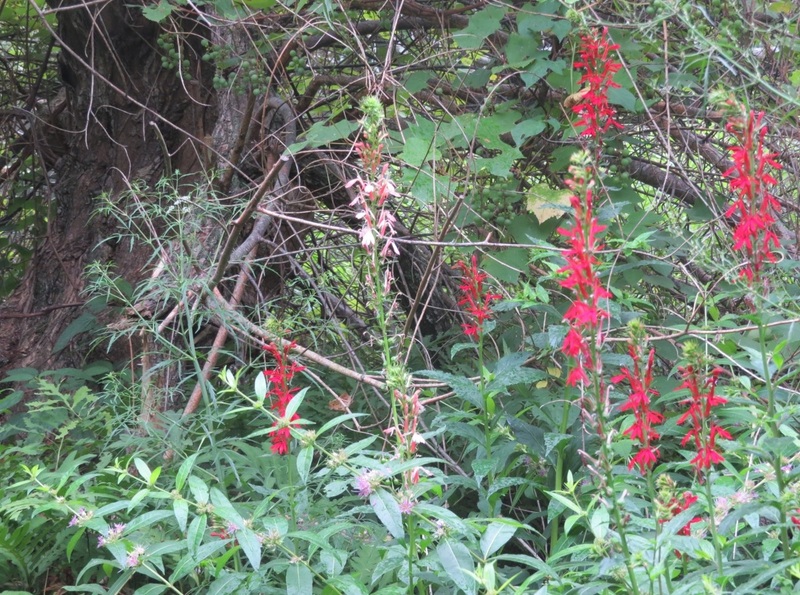 And Silver Springs’ mid-summer cardinal flowers are also a favorite to show. The cardinal flower (Lobelia cardinalis). Note the paler “albino” version in the middle. (Photo by Jeannette Bragger). But both volunteers are quick to discuss less appealing plants as well. “Poison ivy,” says Nancy, “is important to point out, too!” Below, Jeannette considers yanking out noxious spotted knapweed. 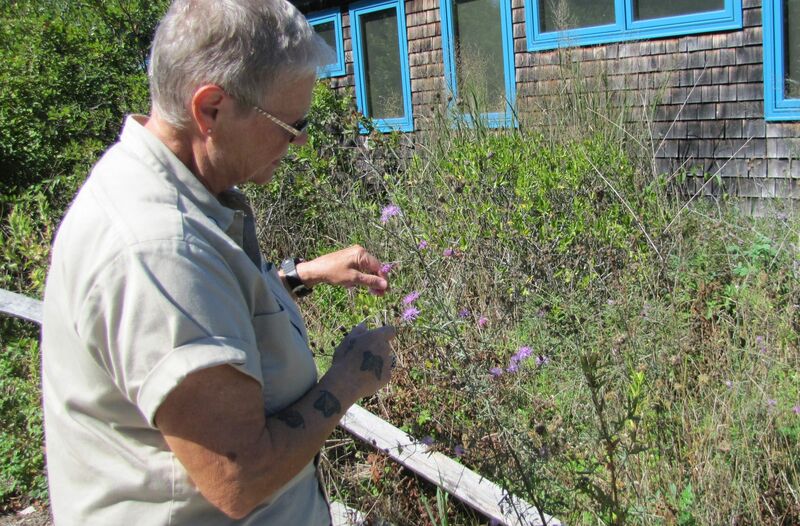 Jeannette Bragger regards with scorn a spotted knapweed, an aggressive non-native plant with a purple thistle-like flower that steals resources from other plants that grow near it and is even toxic to them. Jeannette and Nancy also enjoy leading their fellow trail naturalists on botany walks. Any volunteers interested in joining a walk next spring or summer can contact volunteer coordinator Christopher Green. This entry was posted in Updates on September 27, 2018 by Wellfleet Bay. Love seeing this terrific article about Nancy & Jeannette! Would like to do a walk with them one day!